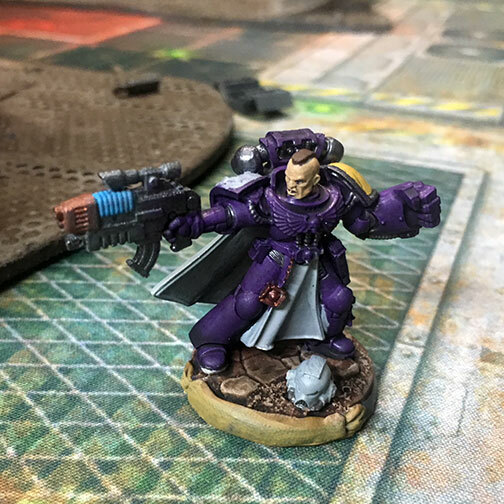 Warhammer 40,000 – Eighth Edition saw the birth of Primaris Space Marines, part of moving the story forward and adding new "scaled up" Space Marines to the model line. To be honest I was on the fence about them. The bigger models were ok, and some of the designs were unique and cool, but for the most part I didn't see them as being worth the points investment or monetary investment to add them to my existing Space Marine force. Chapter Approved 2017, saw a price drop across the board for the Primaris units. Which made them more attractive to try out. The release of some less expensive easy to build kits made them more cost effective to pick up. So I drank the Kool-Aid and picked up a few kits and added some to my wishlist. A milestone birthday and Christmas brought me a bunch of new kits. Several Predators, Hellblasters, Reivers, Inceptors and Aggressors are now gracing my table waiting to be painted. This clocks in at 100 PL and 2005 Pts. so I'll need to drop a piece of wargear (melta-bombs) if playing points. I think playing these as Raven Guard makes the most sense. If I plan on camping on objects the -1 to hit is pretty good, and if they get closer the amount of firepower I can put out increases. With the Techmarine, Scouts, Landspeeder and Reviers I should be able to get to the objectives on the other side of the table quickly if need be.